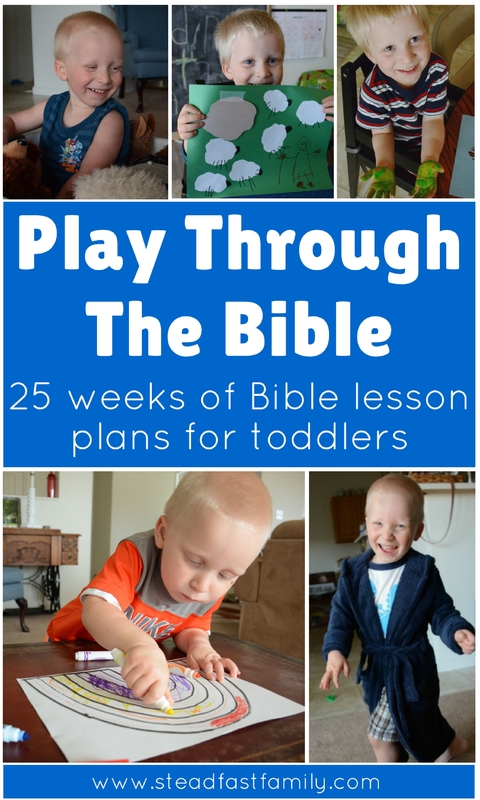 Inside: Preschool Bible lesson plans on the attributes of God – creator. Welcome to the “Who is God?” series! 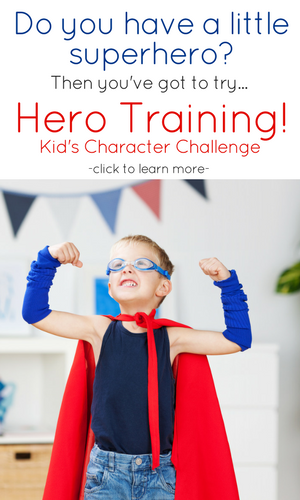 Before we dig into the first set of lesson plans you’ll need to get your visual board set up! Now, this isn’t strictly necessary of course, but it is really helpful (especially for the preschool age group) to have some kind of visual prompt to help them remember all the awesome things you’ll be learning together. 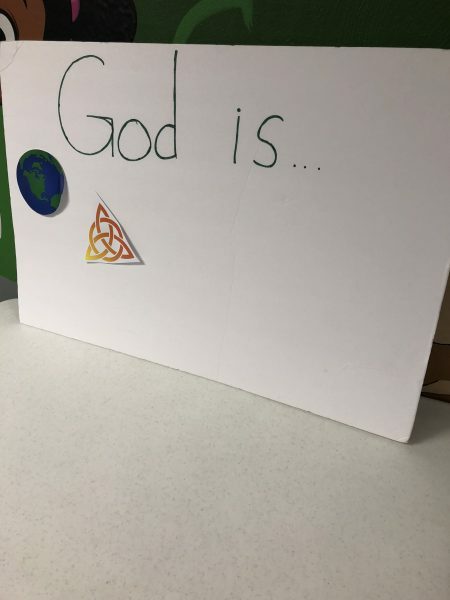 For our’s, I simply wrote “God is…” at the top of a piece of foam poster board. Then for, each characteristic we learn, I tape an image on the board that represents it. We always have this board visible during our lessons. Another idea is to make a simple book for each child and have them paste an image for each attribute on a page of the book. It may be helpful to give a short intro into what you’ll be doing. We used this as our first week’s lesson. Here’s how we did it! Choose a couple songs to sing (we sang our songs for this month, which are linked below in week two). ASK: Can we be friends? SAY: When you have a friend, you want to know more about them! The more time we spend with our friends, the more we learn about them. It is fun to learn more about our friends! Did you know that there is someone who wants to be your best friend in the whole world? It’s God! He loves you so much and wants to be your friend! And when we are God’s friend, we want to learn more about Him! So that’s what we are going to be doing together. At this point you can also share your specific situation (Sunday school class, Bible time with mom on Tuesdays, etc) if desired. I have also found it helpful to occasionally refer back to how God is our friend and we love to learn more about our friends, especially Him! SAY: When we learn more about God, it makes us want to praise Him more. Lets have a little story time. We are going to read a book about different ways we can praise God. We read the book Psalms of Praise by Danielle Hitchens. 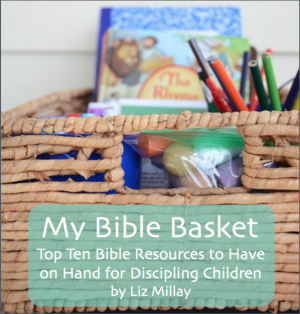 It is a fun book that gets kids moving as they explore different ways to praise God. Shout that back and forth a few times. This is something we do at the end of every lesson! The last thing we do is the finger play “Open Shut Them”, followed by prayer. Now it’s time to dive into our first attribute – Creator! We worked on this attribute for three weeks. SAY: Today we are going to learn something about who God is! (Get out your prepared board – see above). We are going to use this board to keep track of everything we learn about God. ASK: (Hold up your picture of the Earth) What is this? SAY: We are going to put this picture of the world on the board because God made the world! He is the CREATOR. And he didn’t just create the world – He made everything! ASK: Does anyone know whose words are in the Bible? SAY: I’m going to read you a verse from the Bible. It is the very first words in the Bible! (Read Genesis 1:1). The very first thing the Bible says is that God is the CREATOR. ASK: Can anyone think of anything that God made? Let them shout out different things God made. SAY: Those are all really awesome things that God the CREATOR made! 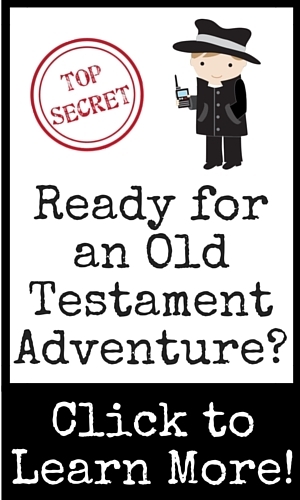 Let’s read a story from the Bible that tells us about all the things God has made. Read the Creation story out of your favorite Bible storybook (find our favorite here or some other recommended Bible storybooks here). SAY: Now I am going to need some volunteers to help me! Choose a volunteer one at a time or all at once. Give each child an object to hold up that represents one day of creation. Once each child has their object, go down the line and have the kids shout out what was created on each day. Then have everyone return to their seats (if you are doing this at home, just have the objects for your child to play with or place in order). ASK: What is your favorite thing that God made? Let them shout out some answers. SAY: Isn’t God amazing?! He created so many awesome things! He is such a wonderful CREATOR. SAY: Today we are going to learn more about about who God is! 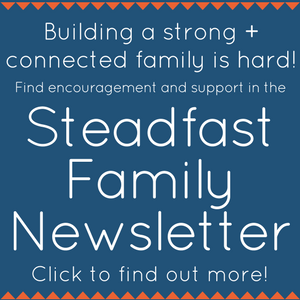 ASK: (Hold up your “God is…” board) What did we learn last week about who God is? SAY: Today we are going to talk about my absolute favorite thing that God created. Do you want to know what it is? It’s YOU! God created each and every one of you. He made you so special just exactly how He wanted you to be. In the Bible it says that we are God’s masterpiece! Does anyone know what a masterpiece is? A masterpiece is something that you worked really hard at creating. It is your best work and you are so proud of it. ASK: Does anyone want to be my helper? Select a few volunteers to come up front. ASK: Do you like painting or drawing? Have you ever made a masterpiece? SAY: Isn’t it awesome that the God the CREATOR’s best masterpiece is you?! So, if you ever want to see a special, loved, masterpiece of God, all you have to do is look in the mirror. SAY: Isn’t God amazing?! He created each of you so perfectly! He is such a wonderful CREATOR. ASK: (Hold up your “God is…” board) What have we been learning about who God is? SAY: Remember how last week we talked about how God made YOU? Well, you know what? He didn’t just made YOU, but He made everyone else too! He made all your friends and everyone else in the whole world. He made each person special and loves them so much! ASK: Does anyone want to be my helper? Select a volunteer. SAY: Here we have *child’s name* – isn’t he/she awesome. (Point out some things about your helper). 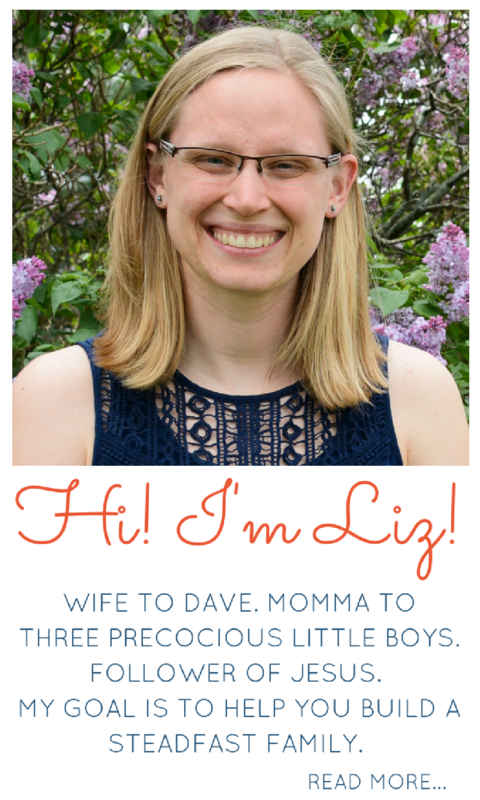 *Child’s name* is pretty cool, but let’s imagine something. What if God made every single person just like *child’s name*? At this point you might have laughter. Discuss how that would be crazy/silly/boring to have millions and millions of *child’s name*. ASK: Does anyone else want to be my helper? Have a few more children come up. Compare heights, hair/eye/skin color, favorite food/color/animal, etc. Talk about how they are all created different and they are all special and God’s masterpieces. If you are doing this at home, you can compare family members and friends, or pictures from a book. At this point, depending on the size group you have, you might have lots of kids wanting to share their favorite color, etc. Give them a chance to share by having everyone answer the question(s) together on the count of three. SAY: So don’t forget that when you look at other people, you are looking at one of God’s special masterpieces. We can celebrate all the awesome and different ways God made our friends. SAY: Isn’t God amazing?! He created each of you so perfectly! I’m so glad that he made all of you! He is such a wonderful CREATOR. 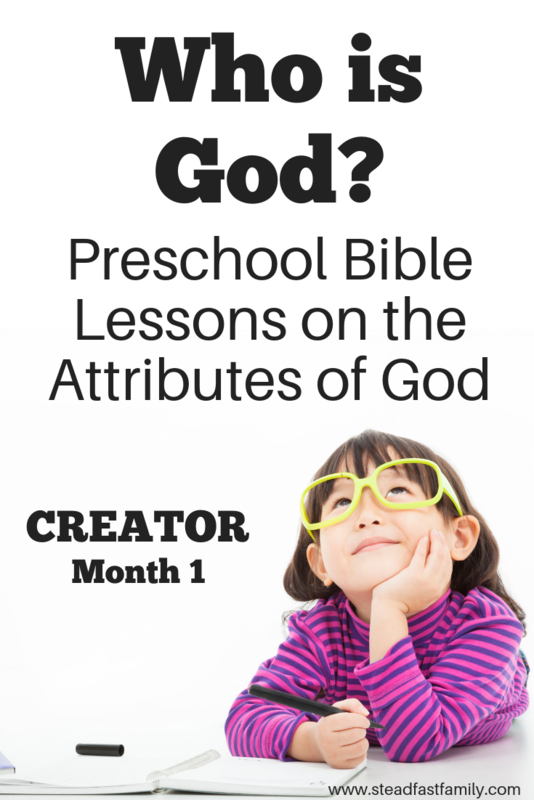 Well, that’s all for the first month of preschool lessons on the attributes of God! Stay tuned for next months (Trinity! ).